An NDB approach, often referred to as an ADF approach, is one in which the principal fix is a nondirectional beacon. Accordingly, the approach is flown mainly with the ADF receiver. On such an approach, you don't simply home on the station, you use the ADF for tracking a specified course. This is a short trip—about 15 minutes—much like a local air taxi flight, but it's an interesting one. In good weather it's quite scenic: Mt. Ranier will be prominent in the distance as you depart Olympia; the interstate highway and the built-up area south of Tacoma will stand out along the way; and your destination runway at Tacoma Narrows is unusual because of the way it extends out onto Puget Sound. However, though the ADF approach you'll use is simple in concept, it's really not an easy one to do well. The difficulty is that you'll have little time to spare at each step, and you'll probably find yourself dealing with several procedures at the same time. Under actual IFR conditions (with clouds), it's a worthy test of any pilot's proficiency. 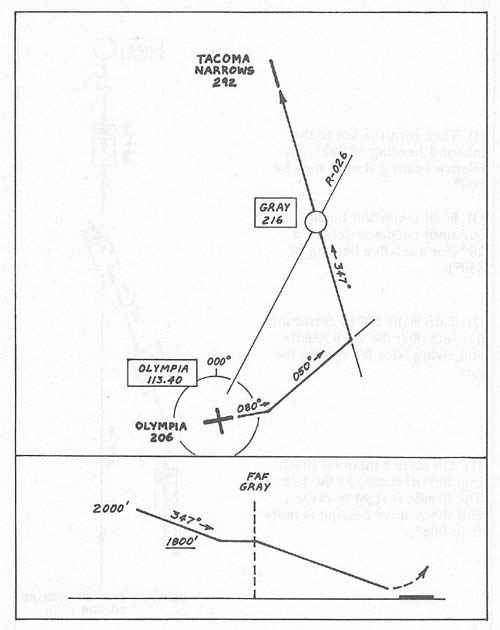 After departing Olympia to the east on Runway 8, you'll turn left to heading 050° while climbing to 2000 feet. Then, using the ADF, you'll turn left so as to fly inbound to the Gray NDB on a heading of 347°. NAV-1 will be tuned to Olympia R-026, the radial that intercepts Gray; thus, when the NAV-1 needle begins to center, you'll know you're coming up on the NDB. At that time, you'll set up and start your descent. After passing over Gray, you'll hold the correct course as you continue your descent to the single runway at Tacoma Narrows. Turning to the Inbound Heading. As you proceed outbound from Olympia on a heading of 050°, you'll be planning to make a left turn to heading 347°, the inbound course to Gray. To determine when to make that turn, you'll use the relative bearing shown on the ADF. Recall that the ADF relative bearing is not actually a bearing in the usual sense. Instead, the relative bearing is simply the difference between your present heading and the bearing to the NDB. Since your heading before the turn will be 050°, and the inbound heading will be 347°, the difference between those two headings is 347° minus 50°, or 297° degrees. Thus, when you're at the point where you should turn inbound, the ADF needle will be pointing up and to the left, and the relative bearing will be 297°. Course Corrections. Ideally, when you roll out on the heading of 347°, you'll be right on course—the ADF needle will be pointing straight up with a relative bearing of 000°. If your heading is 347° but the relative bearing is more than 5° from 000°, then your heading is correct but you're to the right or to the left of your course, which should be corrected. The ADF on the simulator is not too precise. On some versions, at least, it tends to be slow to respond, and the bearing then often jumps in increments of several degrees. Small corrections are therefore difficult to make, but if the ADF bearing is more than 5° from 000°, you should correct your course. Needle Right of Center. If the needle is pointing to the right of center, then you're to the left of your course, as shown in Figure 4–7. Turn right 20°; hold that correction heading until the needle is deflected 20° to the left (20° from your current course); then turn back onto your correct inbound heading. 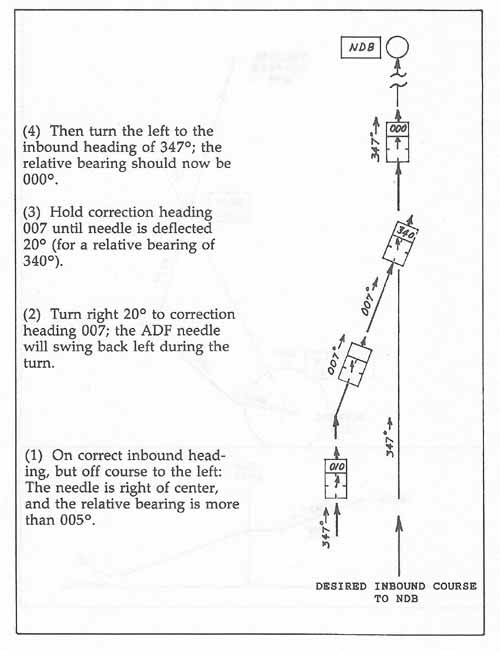 For example, say your inbound heading is correct at 347°, but the needle is pointing to the right of center and the relative bearing is 010°, as shown in Figure 4–7. To get onto the desired inbound course, first turn right 20° (347° plus 20° = 007°); then hold that correction heading of 007° until the ADF needle is deflected 20° left of the current heading—which means a relative bearing of 340°. Then turn left to 347° again, the inbound heading. Needle Left of Center. If the needle is off to the left, then you're to the right of your course. Turn left 20°, hold that correction heading until the needle is deflected 20° right of the current course—which means a relative bearing of 20°; then return to the correct inbound heading. The Approach. The actual approach plate is provided in Chapter 5. Compare it to Figure 4–8, and keep it available during the flight. Departure. You're cleared for immediate departure on Runway 8. After establishing your climb, turn left to 050° and climb to 2000 feet. Intercepting the Inbound Course. Maintain 050° as the ADF relative bearing moves toward 297° then turn left to 347°, toward Gray. Course Correction, Needle Left of Center. Turn left 20° to heading 327°; hold 327° until the ADF needle is deflected 20° right for a relative bearing of 020°; then turn right to 347°. Course Correction, Needle Right of Center. Turn right 20° to 007°; hold 007° until the ADF needle is deflected 20° left for a relative bearing of 340°; then turn left to 347° (Figure 4–7). Setting Up. As soon as you're established on course, set up for the approach. You have only about 4 minutes from the left turn onto 347° to station passage at Gray, so if you have to make a course correction (see above), you'll probably have to do it as you're setting up for the approach. Descent. NAV-1 is set to Olympia R-026, the radial that intercepts Gray. When the needle first begins to move, begin your descent. Station Passage at Gray. Be on course when the NAV-1 needle begins to move; do not attempt course corrections once the ADF needle begins to drift around the window at station passage. Be no lower than 1800 feet while passing over Gray; after station passage, resume the descent at 500fpm. Landing. At the bottom right of the approach plate, you'll find a small table. It indicates that it's 6.7 miles from Gray, the final approach fix (FAP) to the missed approach point (MAP)—just over 4 minutes at your 90-plus knots. You now have a straight-in approach to Runway 35.